Sachin Tendulkar celebrates his 33rd birthday on Monday. Most cricketers can have nine lives and still wouldn’t go beyond the foothills of his achievements. Yet, there is a call for his head. The Gulliver of our times is being held down by the Lilliputs. Liberate him and you would still enjoy the genius of this man who has been one of the greatest cricketers ever to walk on this earth. The Pakistan Senior Cricket Board gave a new twist to the Veteran Cup controversy, claiming it was the Pakistan Cricket Board (PCB) which allowed Mohammad Azharuddin and Manoj Prabhakar to play in Pakistan. A strokeful 82 by Mohammad Azharuddin guided India Seniors to a three-wicket victory over Pakistan Seniors in the first one-dayer of the 4-match veterans’ cricket series here today. Mohammad Azharuddin plays a shot during the first one day between Pakistan and India senior cricket teams in Karachi on Sunday. Adam Gilchrist smashed a half-century and Bradley Hogg claimed his 100th dismissal today as Australia beat Bangladesh by four wickets in the first limited-overs international. Srinagar is all set to return to the Indian cricketing map. The exotic locale of the Himalayan valley will play host to a first-class game for the first time in 16 years when a series of Ranji Trophy matches of the 2006-07 season are held later this year. Jeev Milkha Singh and Shiv Kapur produced their best golf of the week to finish tied 26th in the $ 1.8 million BMW Asian Open at the Tomson Pudong Shanghai Golf Club here today. It was nothing less than humiliation which was handed out in closed envelopes to three boxers who had brought glory to the country at the Commonwealth Games. Riders of the Delhi Police bagged top positions in the show jumping novice rounds on the inaugural day of the Chandigarh Horse Show 2006 here today. Constable Dharam Pal bagged the first position followed by Capt R. Dagar of 61 Cavalry. Maj Navjit Sandhu in action at the Asian show jumping challenge event at the Railway Territorial Ground, near Kala Gram, in Chandigarh on Sunday. I have no time for all these tales coming out of India — Tendulkar is finished; he can’t face up to short-pitched bowling; he is being “carried” in the team; he should choose between two forms of the game; his injured frame is somehow being held together and horror of horrors, the time has come to look beyond him. From being toast of the nation for a decade and a half, it would now appear as if he stands between the team and the golden future. Shame on all! I sometimes wonder if all this affects Tendulkar. Beyond the profile of equanimity in public, he is after-all a human and it must hurt. But I am equally certain that he would use this wave of cricketing bigotry to rise and inundate the ignorants. It usually stirs champions to life. It always did to me; I would swear under the breath, and sometimes audibly, to spark myself to life. So those who are writing off Tendulkar must do it at their own peril. They shouldn’t have any qualms in eating their own words. Tendulkar has clearly been one of the three best batsmen I have ever seen on a cricket field. I would rate him along with Viv Richards and Sunny Gavaskar as the “unbowlable” batsmen of my era. I remember there was a time when I would put my ability to question only because Gavaskar was still not in my bag. Finally I had him in Hyderabad, caught in the second slip! The memory of it is still so refreshing. With Tendulkar too we always went to the field thinking if we get him, we would be through. And so it was most of the times! I would even rate Tendulkar as better than Brian Lara. The world can swoon over the records and mercurial ability of the West Indian but for me Tendulkar brings infinite value to the dressing room. You judge a man by the respect he gets within his own set of men. Tendulkar is beyond reproach on this issue; Lara would only set the tongues wagging. Too much is being made of his injuries. It is not unnatural for a long-serving sportsman to fall foul with fitness. I too was beset with scores of injuries in my career; if it was not groin, then hamstring; if it wasn’t shoulder, then knees. But I kept rousing myself from the surgeon’s table and doing my stuff on the field. Tendulkar would do likewise. Tendulkar is not old. I mean he is only 33 which is not autumn for a top class batsman and he certainly has more years of cricket left in him. He doesn’t have to choose between one-day or Test cricket: if Inzamam-ul Haq can do so at the age of 36, Tendulkar, who is fitter and more agile, can surely do no worse. Tendulkar’s passion on the field is so palpable: it’s not the sight of a cricketer who is on his last legs. It is also utter nonsense to suggest he is no longer up to the short-pitched bowling. Piece of cake that is what it is to him. Tendulkar is out of touch, his footwork may not be the best at the moment but it doesn’t bring to question his ability. He is just one innings away from good form. I have sensed so in all those little knocks he has played in the recent season. Still, I would advise him to go out and enjoy his one-day cricket. He has imposed too many shackles on himself. At the moment if I have to choose between Virender Sehwag, Shahid Afridi and Tendulkar as my set of openers, I would go for the first two names and that is an indictment in itself for the little genius. Tendulkar appears too concerned with the proper shot and staying till the end rather than flow with the mood and the spirit of limited overs cricket. In a way, this is the time he should do it. There is no dearth of daredevils in the Indian team and the pressure is off him. He no longer needs to get weighed down by the burden of his team. “The Pakistan High Commission granted visas to the entire Indian cricket team, including Azharuddin and Prabakar, to travel to Pakistan for the one-day matches on the advice of the PCB, PSCB president and chief executive Fawad Ijaz told a news conference. Azharuddin, a former Indian captain who played 99 Tests and 334 one-day internationals, is serving a life ban from playing Tests and first class cricket for his alleged involvement in match-fixing while Prabhakar was slapped with a five-year ban in 2000. “When we applied for the no-objection certificate with the PCB, the names of the Indian team were clearly stated. The PCB issued us the NOC on the basis of which the Indians were issued visas in New Delhi,” Ijaz said. “Issuing of the NOC, followed up New Delhi granting visas clarifies that the entire Indian team is here with the permission and knowledge of the PCB.” Ijaz’s remark came in the wake of PCB chairman Shaharyar Khan disassociating his establishment from Azharuddin and Prabhakar’s visit. “The senior cricket board is operating on their own and they have invited Azharuddin and Prabhakar. The senior board is not affiliated with the PCB so they are holding this series on their own,” Shaharyar had said. Ijaz further refuted claims that PSCB was not a affiliated unit of the PCB. “We are an affiliated unit of the PCB. Probably Mr Shaharyar doesn’t know it because we got the affiliation in 1999 during the tenure of Mr Mujeeb-ur-Rehman.” Shaharyar is the fourth PCB chairman since 1999 and assumed office on December 15, 2004. Meanwhile, former Pakistan leg-spinner Abdul Qadir sympathised with Azharuddin who remained India's second most successful captain. “It’s sad that Azharuddin became a victim of circumstances. “I mean Wasim Akram, Saeed Anwar, Inzamam-ul-Haq, Mushtaq Ahmed and Ijaz Ahmed were heavily fined for their involvement in match-fixing but they continued to play Test cricket,” the former magician spinner said. “I know many other cricketers who were involved in corruption but I don't want to open old wounds.” He urged the followers of the game to forget the past and instead of further humiliating these stalwarts, should take pleasure in whatever they can offer now. New Delhi: The veterans’ cricket board of India today came out in support of tainted players Mohammad Azharuddin and Manoj Prabhakar, saying both were technically eligible to take part in the veterans’ tournament against Pakistan. Chetan Chauhan, former cricketer and President of Board for Veteran Cricket in India, said Prabhakar had already completed the five-year ban slapped on him following allegations of match-fixing while Azharuddin had been banned from playing Test and first class cricket. “Prabhakar’s five-year ban is over and Azharuddin is banned from playing Test and first class cricket. Veterans’ cricket does not fall under any of these two categories. So both are eligible to play,” Chauhan told PTI. The BVCI chief said the India-Pakistan series was a friendly series and there was no harm in including Azharuddin in the squad for it. “The veterans’ series is more of a friendly one to improve relationship between the two countries. Since Azharuddin is playing all sorts of festival cricket, there is no harm in his participation in it,” Chauhan said. However, he refused to draw any comparison between former Pakistani cricketer Salim Malik, who was prevented from taking part in the series, and the two Indian players. 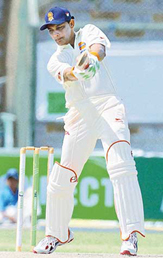 Showing exquisite wrist work and excellent stroke selection, Azharuddin belted eight boundaries and a six in his 78-ball 82 as the tourists achieved the victory target of 254 with six balls to spare. Pakistan Cricket Board Chairman Shaharyar Khan also watched the match and presented the man of the match award to Azharuddin. Amarjeet Singh chipped in with a valuable 42 from 64 balls as Pakistan bowling, spearheaded by Aqib Javed, struggled to create inroads. Off-spinner Ijaz Fakih bagged three for 41 while Zaheer Elahi claimed two for 33. Abdul Qadir and Aamir Sohail scooped one wicket each. Earlier, Pakistan Seniors scored 253 for 5 from the allotted 40 overs. Azam Khan top scored with an 83-ball 71, Aamir Sohail hit eight fours in a 75-ball 64, Raees Ahmed contributed 38, Mansoor Akhtar stroked a rapid 35 while Javed Miandad remained unbeaten on 16. The second one-dayer will be played at Sialkot on Tuesday. Adam Gilchrist of Australia hits a boundary off Bangladeshi bowler Sayed Rasel during the first one-day in Chittagong on Sunday. Australia reached its 196-run target in 44 overs after Hogg grabbed three scalps to help bundle Bangladesh out for a paltry 195 runs in 47 overs after skipper Habibul Bashar won the toss and elected to bat. Bangladesh spinner Abdur Razzak grabbed three dismissals for 36 runs as Australia lost four wickets for 36 runs in 12 overs, after opening pair Gilchrist and Simon Katich combined for 97 runs from 68 balls. Bangladesh got its first wicket when Razzak trapped man of the match Gilchrist lbw for 76, which came off 46 balls and included nine boundaries and five sixes. 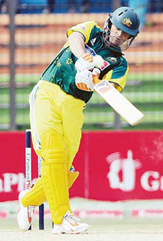 Gilchrist hit his 45 one-day fifty off 28 balls, with eight boundaries and five sixes. Katich (18) was next to go, when Bashar easily caught his pull shot at mid-wicket off Mashrafe Bin Mortuza. Razzak, a left-arm bowler, also trapped Andrew Symonds lbw for a duck and dismissed captain Ricky Ponting (14) in a similar fashion. Michael Clarke (16), playing with a head injury, was run out before last minute replacement Tushar Imran had Hogg (7) caught at mid-on by Syed Rasel. Imran replaed allrounder Alok Kapali, who was injured while warming-up just before the start of the match. Brett Lee (12 not out), partnered by Michael Hussey (36 not out), hit a boundary to achieve the winning target with six overs remaining. Bashar who scored a solid 52 before being stumped by wicketkeeper Gilchrist off Hogg. Bashar hit three boundaries and one six from 93 balls. Hogg also claimed the wickets of Imran (20) and Mortaza (1), to return figures of 3-37. Lee, Symonds and Nathan Bracken had two wickets each, while Mitchell Johnson claimed his first-ever limited-overs dismissal by bowling Khaled Mashud (27). Bracken, who was hit for 13 runs in his first over, struck the first blow by dismissing opener Rajin Saleh for seven. He also removed Mohammad Ashraful for five runs. Lee dismissed opener Shahriar Nafees (16) and Aftab Ahmed (30). Symonds snared the wickets of Mohammad Rafique (8) and Syed Rasel for a duck. The next two matches of the limited-overs series will be played at Fatullah near the capital Dhaka on April 26 and 28. Fall of wickets: 1-26, 2-33, 3-52, 4-79, 5-117, 6-171, 7-182, 8-185, 9-194. Bowling: Lee 8-0-34-2, Bracken 8-2-30-2, Johnson 7-0-34-1, Hussey 3-0-13-0, Cullen 10-2-36-0, Hogg 10-1-37-3, Symonds 1-0-6-2. Fall of wickets: 1-96, 2-101, 3-109, 4-133, 5-155, 6-174. “Teams from North India will play matches against Jammu and Kashmir in Srinagar this year,” Minister for Youth Services and Sports, Peerzada Mohammad Syed, said today. But the day belonged to Gonzalo Fernandez-Castano who won a dramatic finish to take his second title and a cheque for $ 300,000 to make his fortnight in China worth half a million. The Spanish golfer, the European Rookie of the Year in 2005, was second behind Jeev last week in Volvo China Open where he took $ 200,000. Jeev and Kapur took $ 16,290 each this week. While Kapur had five birdies and just one bogey in his four-under 68, Jeev had no bogeys, but he did call a penalty on himself for touching the water on his backswing while hitting out of the hazard on the ninth. He took five strokes, but put down a seven including a two-shot penalty, but for which he would have been under par for the week and inside top-20. “But that’s not the way I would like,” said Jeev, who last week won his fist title in seven years at the Volvo China Open in Beijing. While Jeev had his dramatic moments in the morning, Fernandez-Castano produced some scintillating golf in closing stages and then won a play-off ahead of Henrik Stenson, who had led the field for more than three and a half days only to lose in the end. Fernandez-Castano and Stenson tied at seven-under after 72 holes and then the Spaniard birdied the play-off hole to take the title. In the play-off hole on the 18th, both Fernandez-Castano and Stenson went into the trees, just as former had in regulation play. The Spaniard’s second shot carried past the water and onto the right side of the green. He revealed that he had discussed the shot with fellow Spaniards, Jose Manuel Lara and Ignacio Garrido last night. Stenson chipped onto the fairway and his third bounced off the green and went over. Fernandez-Castano’s third was a sensational chip almost like 16th where he holed it for a birdie and a two-shot swing as Stenson bogeyed, landing nine inches from the cup. Akhil Kumar, Jitender Kumar and Vijender were invited by the All-India Boxing Federation at a felicitation ceremony of Commonwealth Games table tennis squad last night but while the paddlers got the cash awards, the envelope of the boxers turned out to be stark empty! The boxers said they were invited to the ceremony at the last minute and were not told about any cash awards, but the boxing federation was at a loss to explain why empty envelopes, which just had the name of the boxer written on it, were handed in the name of cash awards. “All the three boxers are from Bhiwani and Abhay Chautala, who is president of Indian Amateur Boxing Federation, was supposed to give an award of 25,000. Since the event was organised in haste, the boxers were later called to his residence and handed over the money,” said Rakesh Thakran, an official of All-India Boxing Federation official. But his claims were refuted by the boxers who said they had not received any money till now. “We have not got any money. We were told to come to the residence of Ajay Chautala but we could not go there because we were too late after the event,” said one of the boxers. Akhil was the only boxer to claim a gold medal in 54 kg section. Vijender won the silver in 69 kg while Jitender took bronze in 51 kg Abhay’s brother Ajay Chautala, who is President of Table Tennis Federation of India, gave away Rs 1 lakh and a gold coin to Sharath Kamal, who had won the men’s singles title while the men’s and women’s team were also awarded cash prizes. Over 200 horses along with teams from all over the country have already arrived here, with more expected to join in for events scheduled to be held later. The show, which includes the Asian Show Jumping Challenge and the National Show Jumping Championships, will continue till April 30. Over 60 events are scheduled to be held in various categories. For the first time, a category for children below 10 years, Children-III, has been included in the show, Col N.S. Rajpurohit, member of the management committee, said. The event has seven judges, all of whom are of international stature. Riders participating in the show are from the President’s Bodyguard — the world’s only horse mounted regiment — Army units based in the north-east and Jammu and Kashmir as well as other establishments having horses, National Cadet Corps, Punjab Public School, Nabha, police forces and civilian riding clubs in various parts of the country. Among the notable riders present today was Uday Singh from the Army Polo and Riding Club, Delhi, who recently won the best young rider award in the under-21 category. He also represented India in the International Young rider’s Show Jumping in Kolkata in December. Also putting their horses through their paces were Sub Malchand Bishnoi from the Remounts and Veterinary Corps and Sub Sajjan Kumar from the President’s Bodyguard. Bishnoi stood first in World Challenge in 2002 and then bagged the gold in an international show jumping competition in China. 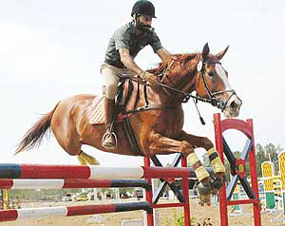 Sajjan Kumar holds the national jumping record of 1.95 metres, which he broke at the Delhi Horse show in 2004 after 32 years,. Col Rajpurohit said the show has also got a tremendous response from young riders, with a hundred or so having entered in the children’s and junior categories. The response can be gauged from the fact that a participant in the junior category, Aliya Dasgupta, has come all the way from Bangalore along with her horse under her own arrangements. She has won several medals at the national level. Other events which were held today were children ball hitting and the Asian show jumping challenge (category A , round A), and a dancing horse display. Abhimanyu Singh and Valandeep Singh bagged first position, respectively, in the ball hitting group I and II. The show was inaugurated by Haryana Governor Dr A.R. Kidwai.